Be the first to share your favorite memory, photo or story of Leone. This memorial page is dedicated for family, friends and future generations to celebrate the life of their loved one. Leone Shaffer Anderson, 98, a resident of Legacy Assisted Living Community, Iowa City and formerly of Charles City, passed away peacefully to eternal life at Mercy Hospital Hospice of Iowa City on Saturday, January 19, 2019, surrounded by her loving family. A private graveside memorial service is scheduled for a later date. Leone Shaffer was born the daughter of Archie and Florence (Rouse) Shaffer on December 17, 1920, in Ayrshire, Iowa. She graduated as valedictorian from Ayrshire High School and from Hamilton Business College in Mason City, Iowa. Leone worked at the ASCS office in Spencer, Iowa. On October 13, 1946, she was united in marriage to C.E. “Andy” Anderson at her parents’ home in Emmetsburg, Iowa. They had 57 wonderful years together. To this union three children were born. 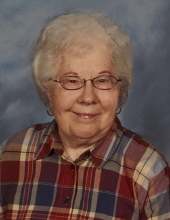 Leone was an active member of Trinity United Methodist Church, Charles City, and a 50 year member of P.E.O. Chapter CY. She was a wonderful and loving mother, mother-in-law, grandmother and great-grandmother. She will be remembered for her fabulous cooking, especially her pies, her needlework, her bountiful garden, her warm smile and mostly her love. Living family members include three children: Craig (Carol) Anderson of Omaha, Nebraska, DeEtte (Michael) Weiss of Riverside, Iowa and Kent (Nancy) Anderson of Mequon, Wisconsin; five grandchildren: Katie (Bryan) Cordes of Chicago, Illinois, Abby (Will) Gates of Chicago, Illinois, Jenny (Brock) Buttrick of Denver, Colorado, Brandt Anderson of Milwaukee, Wisconsin and David Anderson of Minneapolis, Minnesota; three great-grandchildren: Lucy and Oliver Cordes and Anderson Buttrick; two step-granddaughters and five step-great-grandchildren: Rachel (Josh) Funk of Iowa City and their children Rylee and Jovie and Lisa Weiss of Coralville and her children Javon, Maliyah and Jayda; sister-in-law, Norma Shaffer of Emmetsburg; along with many nieces and nephews. She was preceded in death by her parents; her husband in 2003; a grandson, Bradley Anderson; one sister; and two brothers. Memorials may be directed to Trinity United Methodist Church, Alzheimer's Association, or Iowa City Hospice. To send flowers or a remembrance gift to the family of Leone Anderson, please visit our Tribute Store. "Email Address" would like to share the life celebration of Leone Anderson. Click on the "link" to go to share a favorite memory or leave a condolence message for the family.